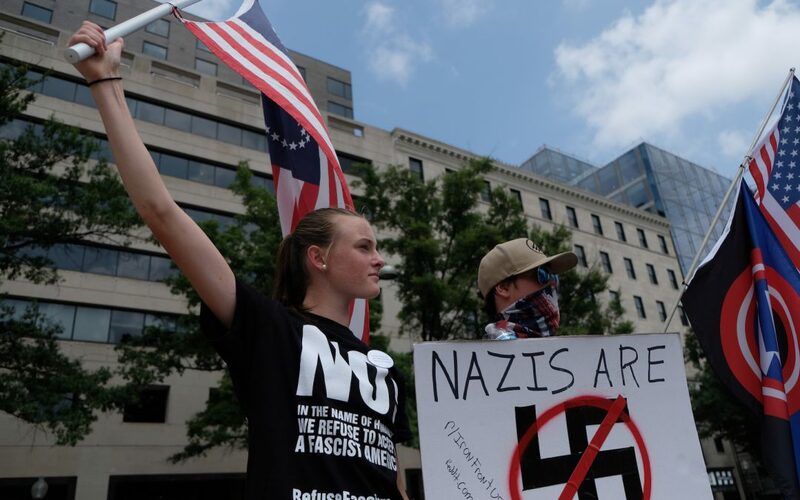 WASHINGTON – About 1,000 protesters gathered a few blocks from a white nationalist rally Sunday, far outnumbering the fewer than two dozen Unite the Right activists who walked to Lafayette Park near the White House one year after the deadly riots in Charlottesville, Virginia. While that group was much smaller than expected, the fact of their presence energized the counterprotesters to gather from around the region to denounce the racism and fascism known to animate the alt-right movement. Those assembled varied in age, geography and race. Many carried signs, some bearing somber messages decrying the Trump administration and its policies, others taking a decidedly lighter tone. One man hoisted a large poster reading, “Make Tiki Torches Non Political Again” – a reference to the tiki torches carried by several white nationalists in Charlottesville last year. “It feels absurd, I can’t believe we have to do this,” said Rena Finkel, 26, from New York, New York. The counterprotesters emphasized, repeatedly, the need to be a visible counterbalance to the hatred and fear incited by alt-right activists. “If we weren’t here, all the cameras would be on them,” said Sean Kratovil-Lavelle, 17, from Kent Island, Maryland. 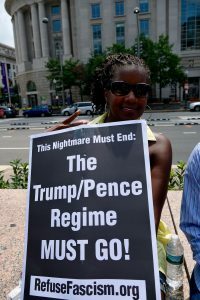 The Answer Coalition, an antiracism group that helped lead the counterprotests, received approval from the National Park Service for a total of 1,500 participants gathered throughout D.C. on August 12. The permit issued to Jason Kessler – the now infamous white-nationalist activist who organized last year’s rally in Charlottesville – estimated 400 participants. Finkel, had planned to be in D.C. Sunday for an anime conference. 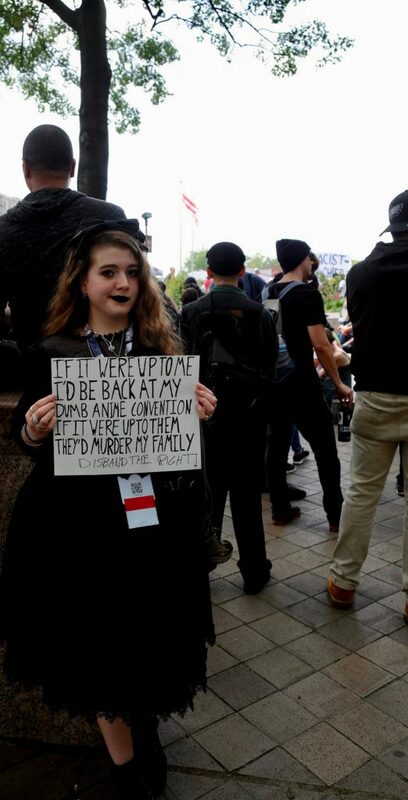 But when she heard of the alt-right gathering, she traded in her plans to meet up with other afficionados of Japanese pop culture, art and fashion, taking her goth costume to Freedom Square instead.